Short Business Description: For more than 30 years, our law firm’s focus has been on counseling our clients to help resolve legal problems in a practical, efficient and cost-effective manner. 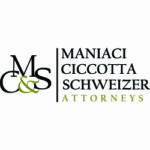 At Maniaci, Ciccotta & Schweizer, LLP we use skills, training and real life experience to simplify complex issues and create long-lasting solutions. Our practice areas include: Wills and Estates, ElderLaw, and Personal Injury Litigation (automobile accidents, falls, medical malpractice, etc.) We remain committed to diligently representing our clients with an attention to detail and a focus on our clients and their families.